Orlando, Fla. — The prevailing theme of day two at the Nautique Wake Games presented by Rockstar was wakeboarding spans multiple generations and knows no borders. Athletes as young as nine and older than 40 and coming from as far away as Brazil put in top tier performances at one of the sport’s most prestigious events. One of the day’s most competitive divisions proved to be the Men’s 2 with athletes between the ages of 25-29 battling it out for a spot in tomorrow’s final round. Separating himself from the talented field of riders was Tim Pitschke, who leveraged a run that included big airs and prime style to win the heat. Pitschke will be joined in the finals by Corbin Blanton, Rob Corum and Dylan Wickersham. Also registering an impressive display of all-around solid riding at day two was the riders in the Junior Women’s division. The cream of the crop was Larisa Morales who used a strong aerial attack to win her heat. Chloe Mills also put in a formidable performance in the heat to claim a spot in the Junior Women’s finals tomorrow. The Nautique Wake Games is stop number one on the eight-event King of Wake Series. Online adult tickets are available for $7 (46% off the gate price) and include an exclusive Overton’s discount code for online buyers only. Gate prices are: $13 (adult); $5 (ages 6-12); free (ages 5 and under). 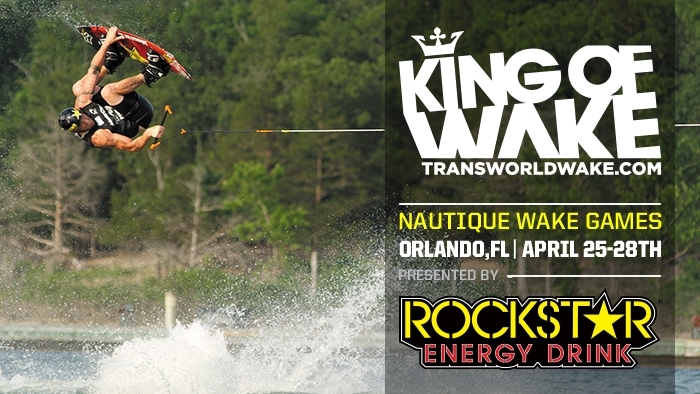 For information on the Nautique Wake Games, presented by Rockstar Energy Drink, visit http://www.kingofwake.com. The Nautique Wake Games, presented by Rockstar Energy Drink is organized by World Sports & Marketing of Orlando, Fla., and has the support of the following sponsors: Nautique Boats, Rockstar Energy Drink, Overton’s, Polaroid Action, Fox, ZEAL Optics Ronix, CWB, Hyperlite, Liquid Force, Byerly, Peavey, PCM Marine Engines and TransWorld WAKEBOARDING magazine.